Beatrice Gbanga, United Methodist health coordinator for the Sierra Leone Annual Conference, says United Methodist maternal and children health care center near Bo is closed after two die from Ebola. The United Methodist Health Center in Manjama, near Bo City, was quarantined July 4 following the deaths of two Ebola-infected children who were found at the center. "The health center will remain closed until the period of quarantining is over and until the District Health Management Team gives clearance before we can resume our normal operations," saidBeatrice Gbanga, United Methodist health coordinator for the Sierra Leone Annual Conference. The two children reportedly were brought to the center from the Kailahun District by their grandmother after their parents died of Ebola. The Kailahun District has recorded the highest deaths since the disease entered Sierra Leone in late May. One of the children, only known as Fatmata, died on the evening of June 30. The children were discovered by Sierra Leone Ministry of Health and Sanitation officials following a tip based on the severity of their conditions. Blood samples taken from nine members of staff and relatives have been confirmed negative, Gbanga said. The samples were immediately taken to the Kenema Government Hospital, which has a viral laboratory equipped to quickly test for the deadly hemorrhagic fever, Gbessay Saffa, a Bo Ministry of Health Ebola surveillance official, told United Methodist News Service. Meanwhile, the Ministry of Health, through the Bo district team, has provided chlorine for the health center and fumigated the entire area including the quarters where the infected children stayed. "We are also closely monitoring those who were directly involved in daily interactions with the children until the end of the 21 days incubation period," Gbanga added. Two more World Health Organization-hired experts in Infectious Disease Control have arrived in Sierra Leone to build the capacity of local health workers in case management, laboratory and surveillance, according to information from the Ministry of Health and Sanitation. The experts also will focus on helping the health ministry establish centers in other districts that have not yet reported cases of Ebola and strengthen the observation units established throughout the country, local media outlets reported. Ebola surveillance officers are looking in the community for anyone who had contact with the infected children, including anyone who has shared a handshake, exposure to fluids from an infected person, direct bodily contact such as sleep with the infected person or other bodily contact with an infected person either dead or alive. "Considering all I have outlined, about 22 people had contact with the children while they stayed at the Manjama Health Center," Saffa said. The main modes of transmission are people caring for sick relatives at home and people attending funerals of victims, according to the World Health Organization. The BBC reports that the World Health Organization said 50 new cases of Ebola have been reported in West Africa since July 3. The total number of deaths since the epidemic began in February is 518, with 844 confirmed cases. Guinea reported two deaths since July 3 but no new cases. Sierra Leone accounted for 34 of the new cases and 14 deaths, while Liberia reported 16 new cases and nine deaths. Key to containing the epidemic is educating communities about how the disease is spread, WHO officials said. The incubation period for Ebola is between two to twenty-one days. Ebola and malaria share similar early symptoms of high fever and vomiting. The sick children who later died from Ebola at the center were first treated for malaria. Saffa said there was panic in the village June 30 when Ministry of Health surveillance officials appeared in the village and some villagers went into hiding because they heard that Ministry of Health officials were going to “arrest” all those who had contact with the children. Saffa said that their team had to allay the fears of the villagers and tell them they did not have the resources to test everyone. He said they were going to wait and observe the identified persons for the incubation period of 21 days and only those who would show the symptoms would be tested. "The only way the United Methodist Church can help us is to liaise with us to continue to monitor the cases. The problem we have with the disease is that people often hide their relatives when they become infected. That is how these children were stolen from Kailahun when their parents died of Ebola," Saffa said. The United Methodist Church launched an Ebola Emergency Response Plan on June 27 in the face of the outbreak. The area of concentration is the Kailahun District. The church effort involves treatment, prevention and public education. The United Methodist Committee on Relief, the denomination's humanitarian relief agency, asks that financial donations be sent to UMCOR International Disaster Response, Advance No. 982450 to respond to this and other emergencies. "We are very concerned about this unfortunate situation in our health facility and the Manjama Community and will do our level best to minimize further infection of people," Gbanga said. "I am afraid that we are very likely to have more cases here in the Bo area following this development,” Saffa said, "because once one is in regular contact with an Ebola patient for over one week, there is a high tendency that one would catch the disease." If any of the contacts shows symptoms and test positive in the coming 21 days, it will be the first confirmed case of the presence of Ebola in southern Sierra Leone; implying that the disease has moved from the eastern boarder district of Kailahun to the south which is less than 300 kilometres away from the capital Freetown. Gbanga said the health facility at Manjama would remain closed because there is no assurance now that the lone nurse who normally attends to patients is not infected herself. "We are, in addition, thinking of testing all the staff of Manjama Health Center in the coming days," she said. Most of the patients who go to the Manjama health center are pregnant women, children and lactating mothers and are among the rural poor from the surrounding villages. The Ebola epidemic has already forced the relocation of a United Methodist pastor from a new mission area in eastern Sierra Leone. 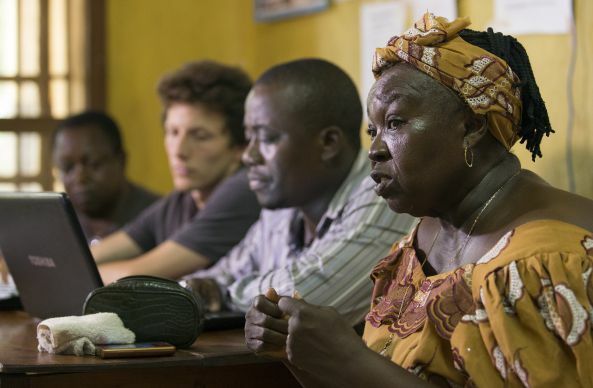 *Jusu is a communicator for The United Methodist Church in Sierra Leone.